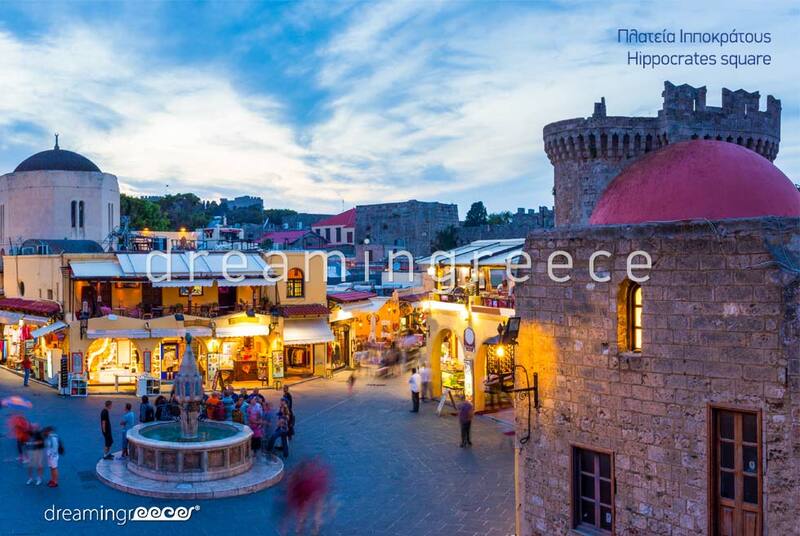 Cosmopolitan Rhodes is both the capital and the largest island of the Dodecanese. The city of Rhodes is built around St. Stephen or Monte Smith’s hill, where the ancient city’s Acropolis dominates. The hill is “crowned” by the ruins of the Apollo’s temple. 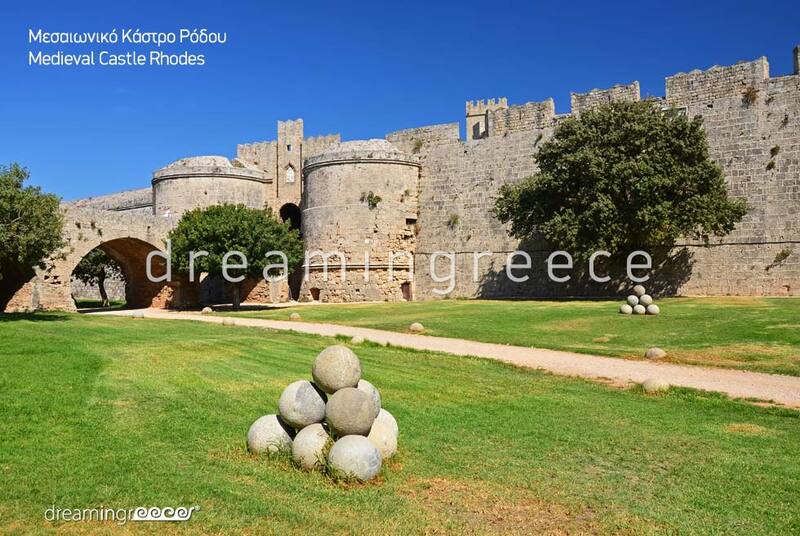 Under the temple, there is the Ancient Stadium of Rhodes, known as Diagoras Stadium, and next to it, a small marble outdoor theater, which nowadays hosts musical and theatrical performances. The hill is the city’s romantic "corner", especially during sunset or at full moon nights, offering magnificent views of both the island’s capital and the sea. Important attractions of the city are Murat Reis’ Mosque as well as the Aquarium; a hydrobiological station which is among the most important centers of marine research in the country. 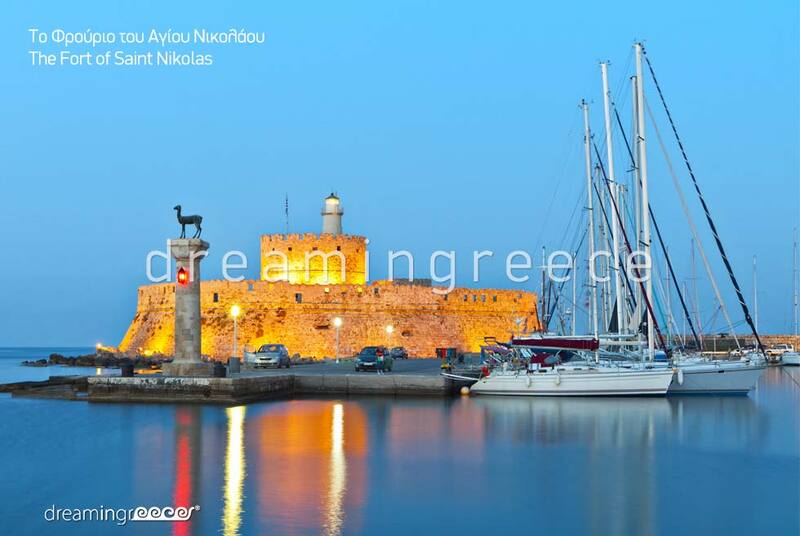 The city of Rhodes extends to Mandraki; the small harbor having two bronze deer statues at its entrance. According to tradition, in the statues’ place, once stood the famous statue of Colossus of Rhodes; one of the Seven Wonders of the Ancient World. 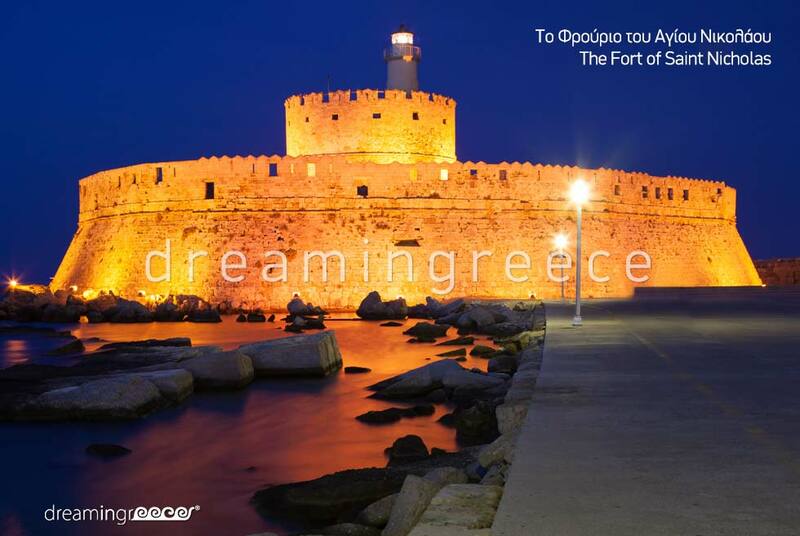 In Mandraki, your attention will be spurred by the three stone mills and the impressive fortress of Saint Nicholas. A reference point of the island is the atmospheric Old Town; a fine example of medieval architecture and a symbol of multiculturalism. The enchanting medieval town is included in UNESCO World Heritage Monuments. Imposing walls, narrow streets, gates, gothic towers, minarets, fountains and picturesque squares will take you back to the times of Knights! Walk across the cobbled medieval Street of the Knights and let yourself feel the magic of this lively castle-town! The Street of the Knights leads in a large square in front of the imposing Palace of the Grand Masters or Castelo as it is alternatively called; a building that seems to have sprung from a children's fairy tale! An important attraction of the medieval town is the Hospital of the Knights; a real masterpiece of Gothic architecture, which today houses the Archaeological Museum. 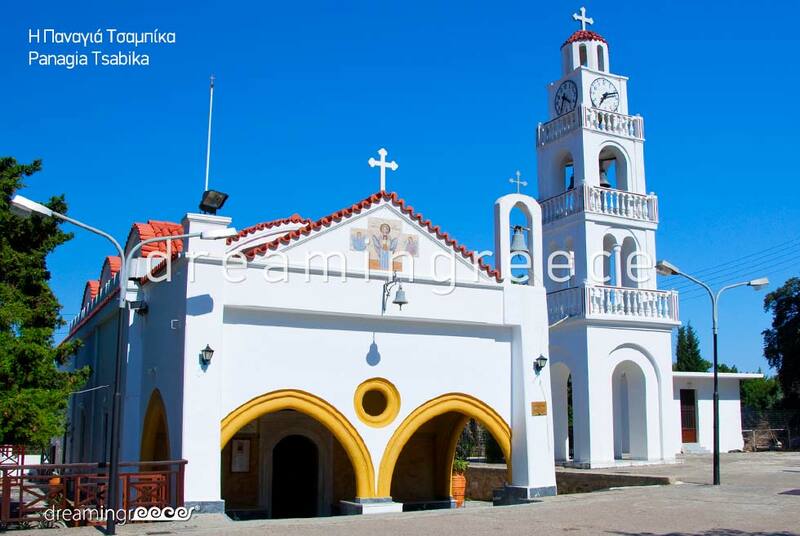 In the area around Castelo, and especially in Kollakio or Castle, other important buildings, including the church of Panagias tou Kastrou (Our Lady of the Castle), the Arsenal, the Knights’ Admiralty and the Clock Tower predominate. In the southern part of the medieval town, in Bourgou, Ippokratis Square, dominated by the beautiful architecture of the Castelanias Palace, can be found. Today, this building houses the Municipal Library as well as the Historical and Folklore Archive of Rhodes. 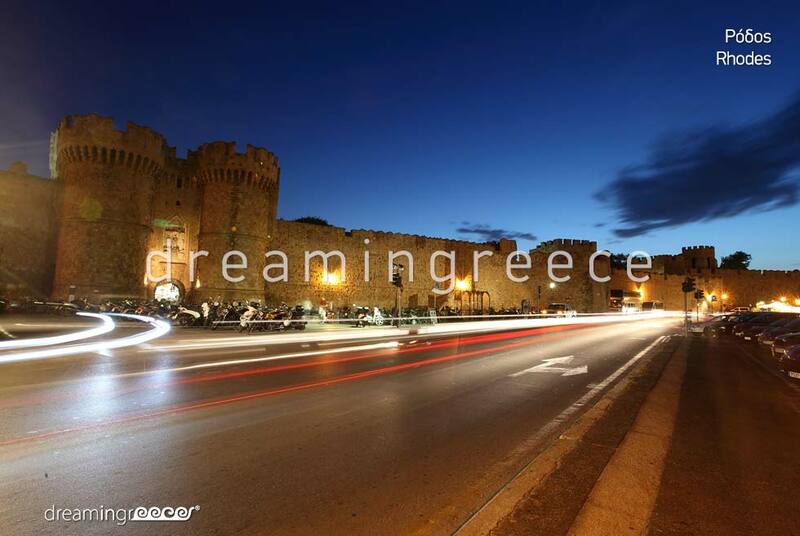 Besides its long history, the capital of Rhodes also boasts modern tourist facilities. Both in the modern and the old part of the town, nightlife choices offered are endless: from sophisticated bars and pubs to discos and crowded clubs, where frantic parties are organized. Downtown you can also find an interesting market where you can buy various local products like jewelry, ceramics etc as well as European branded products. In addition to the Medieval Town, the island is full of other scattered fortresses and castles, which altogether form the network of fortresses built by the Knights of Rhodes. Monolithos Castle is a typical sample. The spot is ideal for enjoying the sunset. Just outside the city, at its southern end, there is an earthly paradise: Rodiniou Park. Streams, ponds with water lilies, bridges and pathways that pass through hibiscus, oleander, pine and cypress trees create a dreamy scenery! Throughout the park, you will see ducks and peacocks, moving freely, giving this scene an exotic "touch"! 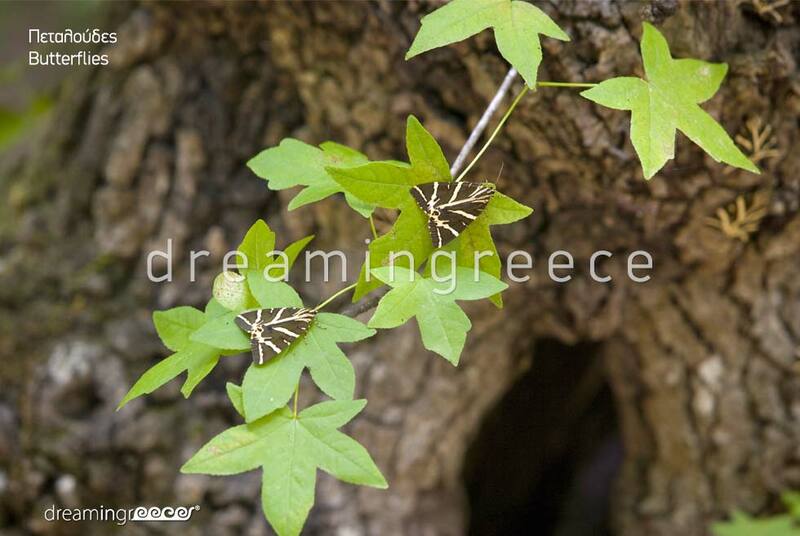 During your stay, do not forget to visit the Valley of the Butterflies; a park with trees, streams, ponds and wooden bridges, which in summer is flooded with colorful butterflies! A unique experience! 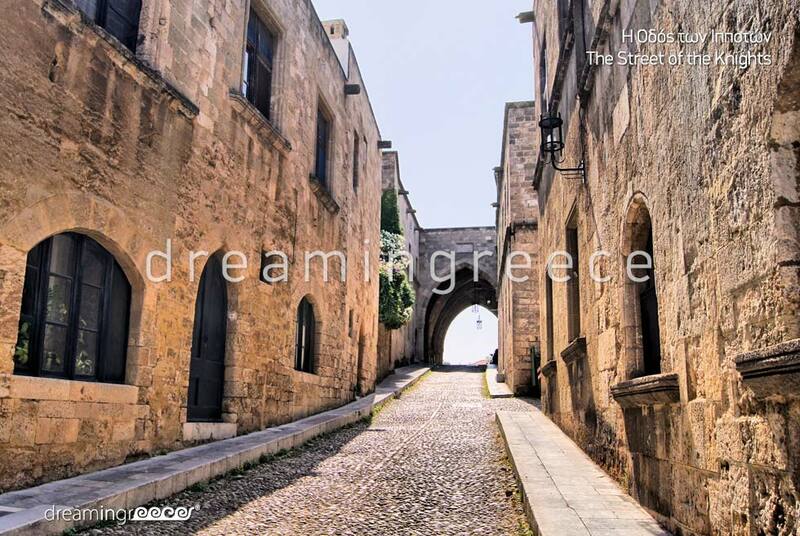 Rhodes has many picturesque villages such as Lindos, which looks like a Cycladic island. The village’s trademarks are the wonderful captain houses, with their pebble mosaics in their courtyards (known as Chochlaka). 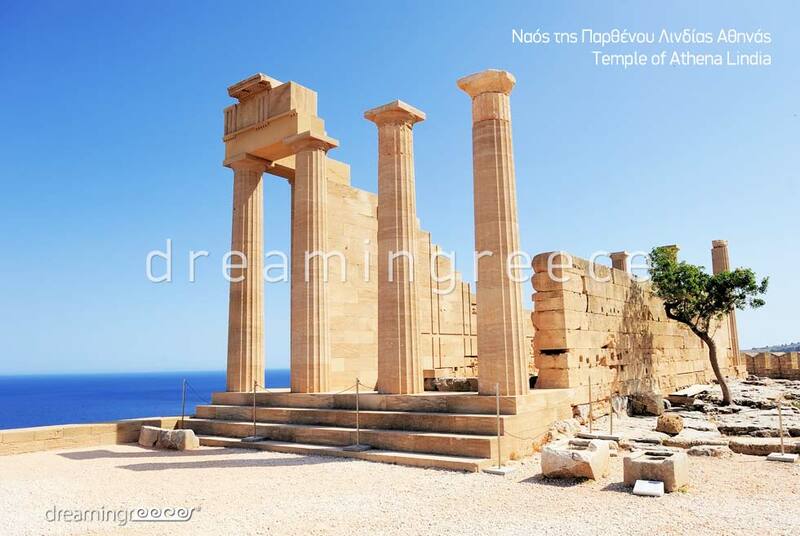 It is worth visiting the Acropolis of Lindos and admire the breathtaking views. In this picturesque village you can find many taverns, restaurants and café/bars, some of which offer great views. In the atmospheric island of the Knights, castles, forts and buildings which are architectural masterpieces are perfectly combined with the heavenly beauty of the place, giving the island a seductive charm and a definitely lovable "character"! Rhodes is famous for its beautiful beaches. Very close to the city center, the cosmopolitan and fully organized Elli Beach with water sports facilities lies. Close to the city, on the northwest side of the island, you will find Ixia and Ialyssos organized beaches. However, the most popular beaches of Rhodes are on the east side. In Kallithea, the wonderful deep blue waters, the pines, the palms and the impressive rocks compose a heavenly landscape! The sandy Faliraki beach, British tourists’ favorite choice; a part of which is the only organized nudist beach of the island, follows. Here you will find beach bars where mainstream music dominates, and a spectacular water park. Furthermore, Anthony Quinn’s pebble beach, known from "The Guns of Navarone", is known for its crystal clear waters surrounded by rocks. Near Anthony Quinn’s beach, there is Ladiko, a small organized beach with fine sand and rocks. The extensive Afandou beach has pebbles and sand, while its waters deepen abruptly. On this beach there are canteens and organized sections with umbrellas and sunbeds. It is worth visiting Tsambika organized beach, with extensive sand and shallow waters. In Agathe you will find a small sandy beach and canteens. Vlycha Bay is ideal for families with children, as the waters deepen gradually. Parasols, sun loungers and canteens are available whilst visitors have the opportunity to engage in water sports. In Lindos, you will find the homonymous small but fully organized beach, which is one of the most popular beaches on the island. 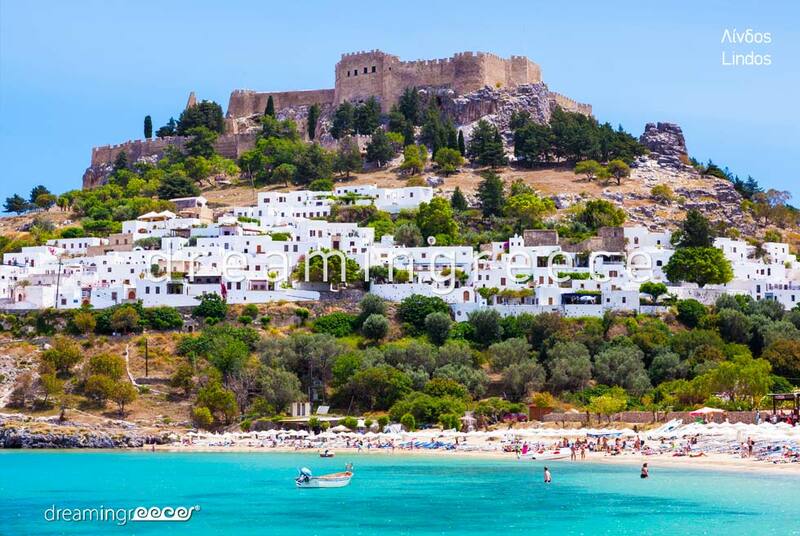 In Lindos village there is a second beach, Agios Pavlos (St. Paul) creek, with beautiful waters and spectacular views of the Acropolis of Lindos. The exotic Glystra (Slipway) unfolds in a lush environment with umbrellas, sun loungers and a canteen. Further south you will find Kiotari, an ideal choice for those who love water sports. In the Gennadi village, you will find the homonymous, vast beach, with sand and pebbles, which has organized sections. At the southernmost tip of Rhodes, there is Prasonisi, with the homonymous islet; surfers’ favorite destination. Two, opposite to each other, inlets, one of which sheltered and one exposed to winds, create an image which looks like a water hourglass! 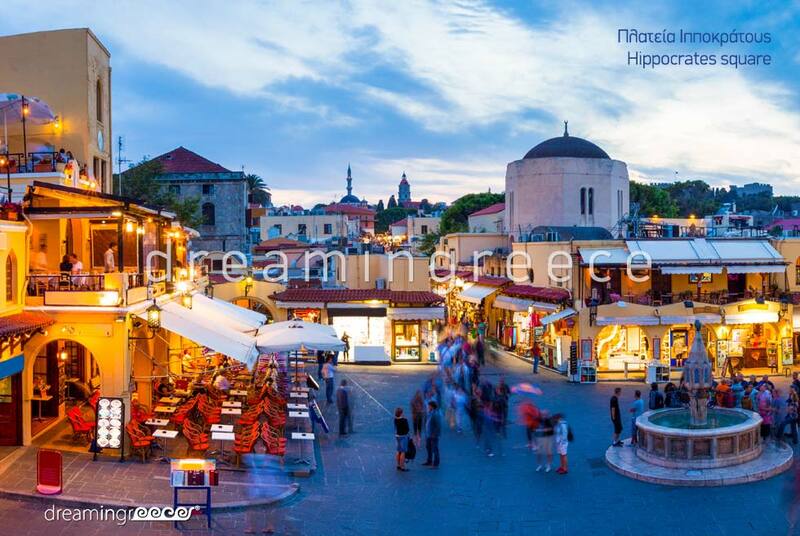 You can fly to Rhodes directly from Eleftherios Venizelos - Athens International Airport, from Macedonia Airport of Thessaloniki, as well as from Nikos Kazantzakis Airport of Heraklion, Crete. For more information on the flights schedule from Athens Airport click here. 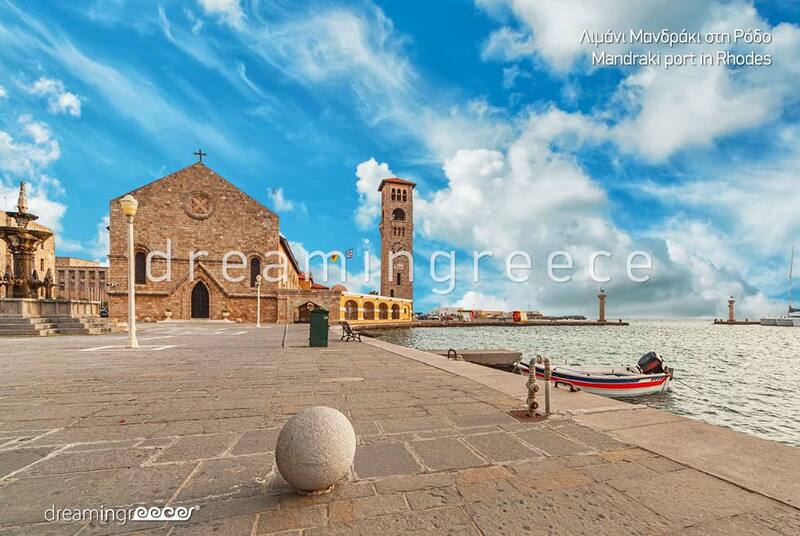 You can also travel to Rhodes by boat, from the port of Piraeus, on the Blue Star Ferries line, as well as from Heraklion, Crete on the ANEK Lines ferries. The island of Rhodes is connected by boat with the islands of Santorini, Crete (Heraklion), Kos, Patmos, Leros, Syros, Amorgos, Kalimnos, Karpathos, Astypalea, Lipsi, Nisyros, Tilos, Halki, Symi and Kastelorizo. For your transportation on the island you can use the Intercity Buses (KTEL Buses of Rhodes), the city buses, as well as taxies, which can take you to any tourist destination on the island. For more information on the routes of KTEL Buses of Rhodes click here. You can also rent a car or a motorcycle from any rental office.